In 1962 a group of Mt. Healthy residents raised funds to save the Free Meeting House. 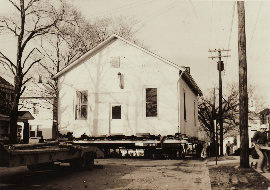 The building was moved from the northeast corner of Compton and Perry Streets to its currnet location on McMakin and restored in 1964. At that time the group decided to create a museum in the building, and the Mt. Healthy Historical Society was born. To preserve the history of Mt. Healthy, to provide research and educational services, and to be a living historical resource for our community and its residents. Do you have items that you would like to donate to our collection? Read our Collections Policy, and contact us.